Kampa is actually a small artificial island, from one side (from Prague district Malá strana) it’s separated by a mill ditch Čertovka, with some very old mills, from the other side by the river Vltava. There also used to be a mill that was reconstructed and there’s the Kampa Museum which is worth visiting (as the museum of modern art). 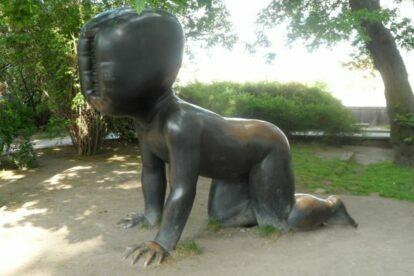 Near this building are three huge statues of crawling babies by contemporary Czech artist David Černý. I remember when I was a child I often came here with my parents for a walk. We started at Pražský hrad (the Prague castle) and by crossing Karlův most (Charles bridge) we ended up standing on Kampa. Down a broad street lined with benches (on the right side is a little alley leading to Lennon’s wall), where I sometimes even now sit and just enjoy the moment, we headed straight to the park, which I really liked when I was a child. Now I like it maybe even more, because it is a great place to hang out with friends, sitting on the grass and sipping from a bottle of wine.